Go the distance in the Nike Core Solid Cut-Out tank. Featuring long-lasting Nike Performance Poly fabric, this suit offers a streamlined fit which reduces drag and increases efficiency in the water, while thin straps enhance your range of motion. Nike Performance Poly - Designed to perform in and out of the pool, Nike Performance Poly offers superior comfort and a lightweight fit. 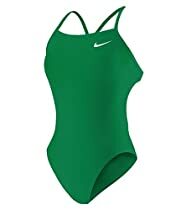 Created from durable performance polyester, Nike Performance Poly is designed for long sessions in chlorinated water and its stay-fast color and stretch-resistance means you look good day in and day out.